They're the ones who live life closer to the bone, Oakley MX riders push their limits with every twist of the throttle, and they demand the best MX goggle technology in the industry. With decades in the sport Oakley has produced countless innovations for pros that refuse to compromise, and the Proven MX Goggle adds octane to the whole idea of performance. To keep you focused with all day comfort, the Oakley Proven MX Goggle combines a true anatomical fit with triple-layer face foam that wicks away sweat. Venting keeps your face from stewing when fellow motocross riders boil your blood by daring to cross your path, and posts are included for your tear-offs. Giving your eyes the UV protection they need, the scratch-resistant Lexan lens also comes optimized with anti-fog treatment. 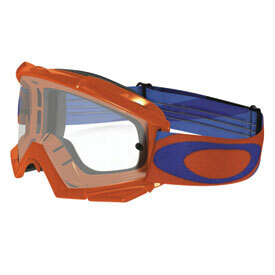 On top of visual impact, the Oakley Proven MX Goggle comes with the protection of EN 174 rated impact resistance. F2 Anti-fog, scratch-resistant and impact-resistant Lexan lens. Have always worn Oakley Proven. If the price and quality continues to stay they same I will continue to buy these goggles. Goggles are fantastic. Comfortable, look good and they work perfect with Roko straps. I have a small head and was surprised they fit so well. They do fog up when I stand still for too long and i was surprised at how easy the lens scratched. Other than that I really like them. These run small. I will save them for my kid. Comfortable, foam lasts long, resists sweat and the cheapest Oakley you can buy. I've had these goggles for about a season now, and I have been very pleased. They're a very good balance of dust protection and breathability - I can't think of a single time when they've fogged up, and unless you're behind someone in an area with really fine dust/sand, you won't get anything in your eyes. Fit is great, but maybe a touch on the narrow side as far as field of view goes. Overall I like them very much. Great fit and comfort. I got the dark smoke lens which is awesome in the sun but to dark when in deep woods and cloudy day. Best for open area sunny day riding. These goggles look good and fit very nicely. I'm definitely a huge fan of the hot pink and lime green!! I am so happy with my oakley goggles. they have good airflow and style. they are good durable goggles. good for the price also. they do what you need them to. One of the most comfortable pair of goggles I own! plus the lenses are easy to change. I HAVE OWNED LOTS OF GOOGLES. AND THESE LOOK THE BEST AND ARE VERY COMFORTABLE! Good goggles, back order took forever. Goggles look fantastic and i appreciate Rocky mtn. working with me and trying to help me out but these goggles took for ever for the manufacturing company to ship to RM and this was a bit frustrating after the third different date i was given for expected shipment. So if you can get them while they're in-stock they're great goggles. This is a great product, They work really good and look pretty cool. and for a fairly good price to. Will these work with a Roko straps? I use Roko and need to know compatibility.